In a world overrun by aliens, a soldier sent to guard a remote outpost comes to suspect the creatures might not actually exist. 57 years after an alien race dubbed “the nonesuch” overran the planet and killed 95% of the population, the majority of survivors continue living underground. Fear is so widespread, popular belief contends that encountering a nonesuch means certain death. Thus, no common men living underground have ever seen one of the creatures. Outside of stragglers who refuse to go underground, the only chance to see the surface is to become a soldier for the United National Unions (UNU). Soldiers are assigned 100-day tours of duty to monitor designated outposts for signs of nonesuch and to direct any stragglers to refuge underground in Exilium. 100 Days – Private S.U.M.1 arrives for the start of his service at Outpost Cerberus. SUM1 learns that his predecessor had to be evacuated, requiring SUM1 to take over as part of the Emergency Replacement Task Force. SUM1 begins a daily routine of eating rations, smoking a single cigarette, ensuring that the automated defense circles for the area remain intact, and reporting to headquarters every 12 hours. 87 Days – SUM1 captures a white rat. SUM1 names the rat “Doc” and gradually begins speaking to it like a person. He also starts sharing his rations with the rat. A radio announcement reports of a nonesuch attack at another outpost where there were no survivors. After thinking he spotted a possible nonesuch lurking in the forest outside, SUM1 reports his sighting only to be assured that there are no nonesuch in his area. 71 Days – An exterior camera malfunctions. While investigating, SUM1 finds birds nailed to trees along with a UNU soldier’s dog tag designated VAX7. SUM1 confirms that VAX7 was his predecessor. The UNU tells SUM1 that VAX7 had to be evacuated because he fell ill, but he is currently safe. 65 Days – SUM1 sees something in the woods again and reports it. He also discovers blood spatter on a bunker wall he suspects may have come from a gunshot suicide. SUM1 breaks into VAX7’s old locker and finds a sketchbook. The sketchbook includes a map identifying neighboring Outpost Gram. 54 Days – SUM1 tries hiking to Outpost Gram, but triggers an alarm as well as a painful pulse device implanted in his leg that prevents him from leaving his operational area. SUM1 instead climbs a tree. Using sunlight reflections, SUM1 sends a Morse code message in the direction of Outpost Gram. 40 Days – During a power failure, SUM1 suspects that a nonesuch may have infiltrated Outpost Cerberus. SUM1 makes a report. His fear is again dismissed by an assertion that the sensors show nothing abnormal. UNU agrees to send a technician, known as a “Mac,” to inspect the system and make any repairs. SUM1 reviews archival footage of himself at the monitoring station. He thinks he sees something in the shadows behind him. 39 Days – SUM1 answers a call over a walkie-talkie that turns out to be from KER4, Outpost Gram’s guard, looking to speak to VAX7. When he learns he is speaking to SUM1 instead, KER4 refuses to say anything further. 35 Days – SUM1 asks where the Mac is. HQ claims that they are merely ensuring a safe route for the Mac due to a recent attack. 34 Days – SUM1 finds mother and daughter stragglers in the forest. He tries offering them passage to Exilium, but they flee in fright. Later that night, SUM1 tries radioing KER4 again, but receives no response. After hunting a deer and spending time in the forest, SUM1 shouts in frustration toward Outpost Gram. SUM1 is caught without his protective mask when toxic emissions come up from the ground. SUM1 thinks he spots a creature in the trees before falling unconscious. 29 Days – After recovering, SUM1 radios KER4 with a warning that the nonesuch may have penetrated the defense circle. 14 Days – The Mac finally arrives at Outpost Cerberus. Following a suspicious story about his prior encounter with VAX7, and after he injures Doc, SUM1 pulls a gun on Mac. SUM1 demands that Mac access the data archive from VAX7’s time at the outpost. SUM1 beats Mac when he refuses to cooperate. Mac eventually hacks the system, but hits a firewall that requires personal access codes from two different soldiers. Mac distracts SUM1 and suddenly stabs him. The two men fight until SUM1 injures Mac and recovers his gun. Mac tells SUM1 a war story about surviving an encounter with nonesuch. Believing that Mac is lying, but knowing Mac wants to see his family again, SUM1 locks Mac in a sealed room. KER4 finally responds to SUM1. KER4 provides his access code, allowing SUM1 to review the footage of VAX7. SUM1 sees VAX7 growing mentally unstable over time. SUM1 theorizes VAX7 was driven mad by UNU’s lies about the alien threat. SUM1 tells KER4 his suspicion that the nonesuch don’t exist because nobody has actually seen one. He further claims that the crisis was invented to preserve resources for the privileged by pushing the poor underground. KER4 warns that SUM1 is suffering from the same delusions as VAX7. 07 Days – SUM1 throws a fit of frustration after hearing a report of nonesuch advancing. SUM1 finds Doc dead from eating rations, causing SUM1 to believe the UNU poisoned his food. SUM1 ventures outside naked and lies on the forest floor. An apparent creature suddenly chases him. SUM1 kills it. SUM1 removes some of the creature’s animal skin garments and finds a tattoo identifying his feral attacker as VAX7. SUM1 returns to Mac. SUM1 accuses Mac of being part of a conspiracy to spread fear. SUM1 demands that Mac show him where the defense circle power supply is. SUM1 tells KER4 that he is going to disable the defense system to prove there is no alien threat and then come to see KER4. KER4 tries telling SUM1 that they can sort out the situation together. 06 Days – SUM1 sets Mac free. SUM1 then disables the defense circle along with his personal communications transponder. SUM1 arrives at Outpost Gram to find its hatch wide open and the bunker empty. From the tower, he hears an ear-piercing shriek that Mac warned him was a sign of the nonesuch. SUM1 looks outside and sees the horizon lighting up from warfare. SUM1 flees as the forest becomes a battlefield. Mac comes to SUM1’s rescue. However, Mac is suddenly killed by a giant nonesuch. SUM1 makes it back to the security bunker in Outpost Cerberus and seals himself inside. A nonesuch eventually breaks in and stalks toward him. SUM1 pulls up his gun in contemplation of suicide. The creature prepares to attack. A gunshot is heard as the screen cuts to black. 57 years have passed since an alien race dubbed “the nonesuch” overran the planet, killing 95% of the population. The nonesuch are so dominating, survivors driven underground live in constant fear that to even lay eyes on one of the creatures assures certain death. It is possible to visit the surface where humanity once flourished. But there is a catch. Common men must train as soldiers and sign on for a 100-day tour of duty, acting as solitary outpost guards monitoring their designated perimeters for hostile activity. Any stubborn human stragglers encountered are to be directed toward forced refuge underground. Dispatched as an emergency replacement after his ill predecessor is evacuated, Private S.U.M.1 arrives at Outpost Cerberus to do exactly that. Lonesome days are filled by following an identical itinerary of doing drills, eating rations, smoking a single cigarette, and reporting to HQ every 12 hours. Barely three weeks into his term, SUM1 begins suspecting he isn’t alone at the remote forest bunker. HQ assures him there is no nonesuch activity in his area. Birds nailed to trees and a furtive shape in the woods suggest otherwise. Paranoia joins hands with cabin fever once SUM1 uncovers clues inferring command may not be telling the whole story. Why does the government want everyone underground? Why isn’t SUM1 permitted to contact other outposts? What really happened to Cerberus’ previous guard? As SUM1 digs deeper, he wonders if he has cracked a conspiracy almost impossible to believe. SUM1 starts doubting if nonesuch even exist at all. And his unraveling mind has him ready to do whatever it takes to finally uncover the truth. With punch-in-the-nose names like “SUM1” and “nonesuch,” writer/director Christian Pasquariello obviously isn’t making an effort to disguise his allegory of Everyman vs. Imagination. Like any isolation-based thriller, “Alien Invasion: S.U.M.1” gets its juice from the “is it all in his mind or is it really happening?” question that comes with an unreliable narrator suffering from the stress of solitary confinement. Unlike “The Thing” or even “It Comes at Night” (review here), “S.U.M.1” is more about the tangible mystery than the intangible paranoia. Whereas similar setups amplify psychological dread or claustrophobic tension, the subtle suspense in play here comes from figuring out the fiction and arriving at hard answers. In the role of SUM1, “Game of Thrones” fans get to see Iwan Rheon, who played Ramsay Bolton on HBO’s hit series, as an easily rattled military rookie instead of an overconfidently sneering sociopath. Rheon is as engaging as the script allows, which is enough to hold minimal attention. However, it isn’t enough to create an exceptionally memorable character. That’s a problem given that SUM1 is literally the title attraction. SUM1 embodies his name too well by being so much of an open-ended anybody, he doesn’t have a magnetic identity to hook into. We know nothing about him, and have nearly no incentive to invest in his ultimate outcome. SUM1 then runs into the common problem that men in such movies often do by mainly having only himself and disembodied voices to interact with. It’s thus a long slog of intentionally repetitive scenes to establish his daily cycle of mundane doldrums. 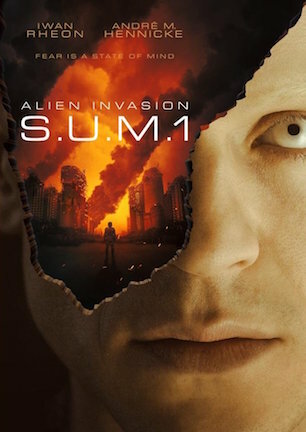 “Alien Invasion: S.U.M.1” predictably jumps such hurdles by conveniently giving SUM1 a pet rat to talk to, as these movies almost always include a ‘Wilson,’ so space isn’t completely occupied by uneventful silence. The bigger bump “S.U.M.1” hits is that a feature-length film is too wide a frame for this particular one-man show. With its single interior set and modest CGI effects, the movie feels like an extended episode of the 1990s “Outer Limits” revival. As SUM1’s routine repeats and intertitles count down 100 days in increments from one to a dozen, the slowed speed sends a sense that identical ground could be covered in half the time as a single TV episode just the same. Tasking the straightforward story to do more work than its scope can handle results in slow burn sci-fi without the ammunition to keep its entertainment artillery locked and loaded. Scenery has a gritty sheen and the story has enough intrigue to get “Alien Invasion: S.U.M.1” going. Iwan Rheon also has the screen presence to keep pushing the plot forward. But admirable low-budget ambitions run short on unique ideas to maintain 90 minutes worth of momentum. With an endgame like this movie has, the stakes need to be higher for the resolution to hit harder. “S.U.M.1” comes out a touch too much like its namesake: as indistinguishable as any interchangeable peer standing alongside it. July 31, 2017 by Ian Sedensky.